They were absolutely fantastic at this office. The staff was very pleasant and were able to answer all of my questionsin English and Spanish. They were very attentive to all my needs. Dr. Qureshi’s bedside manner was superior. I really like that he made sure to recommend simple ways to improve on my overall health and quality of living. They were absolutely fantastic at this office. The staff was very pleasant and were able to answer all of my questions in English and Spanish. They were very attentive to allmy needs. Dr. Qureshi’s bedside manner was superior. I really like that he made sure to recommend simple ways to improve on my overall health and quality of living. My mom & I always enjoy seeing Dr Qureshi. He is very knowledgeable & professional. His staff is very courteous &always ready to assist you. Thank you! My mom & I always enjoy seeing Dr Qureshi. He is very knowledgeable & professional. His staff is very courteous & always ready to assist you. Thank you! 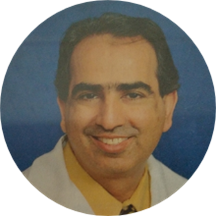 Dr. Imtiaz Qureshi is an experienced board certified internist treating patients in the Orlando, Florida community and surrounding area. Dr. Qureshi graduated from Dow Medical College with a Medical Degree and completed his Internship in Internal Medicine at the Long Island Jewish Medical Center. Dr. Qureshi completed his Residency in Internal Medicine at Mount Sinai Hospital. He is currently affiliated with Florida Hospital Orlando in Orlando, Florida, and Orlando Regional Medical Center in Orlando, Florida. Dr. Qureshi is highly multilingual, speaking English, Spanish, Hindi and Sindhi. Dr. Qureshi treats patients for many reasons, including for vaccines, high blood pressure, ECG/EKG, cholesterol, sinus problems, sleep problems, migraine, Certified Medical Examinations and much more. I went to get a refill on my prescription. I assumed they sent the prescription to CVS. I drove 20 minutes to CVS by my house and they told me since the prescription is a narcotic that I need the actualpaper and the doctor can't send it electronically. I called them and they told me to drive back and get the paper. I said okay I will be there in 20 minutes. I get there and the door is locked. They finally let me in after banging on the door and calling repeatedly yelling that they're in lunch. I literally told them I would be there in 20 minutes and they could mention they would be on lunch in 20 minutes?! Absolute JOKE! Dr Qureshi is very good and explain everything very clear to me! Dr Imtiaz is the best doctor in Orlando. He treats every illness and works with you to be on the right Medication. My visit went very good. Dr Qureshi is very nice & very professional . I'm very pleased with him as my primary care physician. He was professional kind and friendly and I enjoyed meeting him. What an amazing practitioner! How amazing? Well, I’ve decided that he’ll be my new Primary Care. The absolute ease in making apppointments; the wait time in the lobby was next to nonexistent; a very thorough examination, diagnosis and careplan. I’ve never felt rushed by Dr. Qureshi, not even when I had a common cold. He and the wonderful staff there, in my opinion, are NOT the standard... that would be expecting too much from other practitioners. They definitely surpass the standard; one visit and you’d agree. Dr Qureshi and his staff were top notch. He's knowledgeable, professional and made me feel he was genuinely concerned to help. I wish every doctor’s office could be as pleasent to visit as this one! I would recommend this Doctor anytime. It was my first visit with this doctor and he was very professional and h is staff was warm and polite. Front desk associates are not educated to work in healthcare field and how to deal with insurances especially they seem to be guessing how the insurances work, what is covered and what out of pocket should be and so forth. Insurancesusually offer hsa or hra. It’s simple to understand. As a healthcare worker if you do not understand what is black and white in front of you the common sense thing to do is call the insurance company to verify that there is a credit and no out of pocket is due for the patient. everyone was so nice that I felt like I was with my family . . it was a wonderful experience in spite of my being ill . .
First time I am visiting Dr. QURESHI, he was very pleasant, took care of my illness, told me to call him the following week to tell how I am feeling... I would recommend him to any one..
My visit went well. I don't blame the doctor for my wait time, some of the patients are extra talkative. He is one of the best doctors i've ever consulted. Office staff pleasant. The doctor was thorough and the wait was minimal. Dr. Qureshi and his Staff were very friendly and courteous. I will be seeing Dr. Qureshi as my general practitioner. Amazing!! It was really fast. The Doctor and Staff are really nice. I scheduled by follow-up this morning and after having a brief conversation about my medications ect. Dr Qureshi asked me due to my medical history and medications if I would be interested in Medical Marijuana, this way I can reduce someof the medications I am taking. I agreed. It worked extremely well when I lived in LA. Excited to get the ball going. As always I love Dr. Qureshi and staff. Standard of Care, for those in the legal and medical field has a heavy meaning. In short, while medical professionals have a lot of latitude, there is a standard of treatment that they must meet in order to avoid lawsuits, maintaintheir licensure and professional liability insurance. Dr. Qureshi surpasses the "Standard of Care", I was impressed that he provided "Optimal Care". Not rushed at all, a lot of medical professionals are so caught up with regulatory issues such as Electronic Med. Recs. ; trying to see "x" amount of patient ls per day/hour, that they ultimately lose sight of "The Patient". Additionally, I was impressed that he is not a doctor who "runs up" the bill. A lot of lay folks don't know, but once you meet your copay/deductible obligations, the doctor can run the bill up very easily where the insurance will pay for it, all it takes is articulating it as medically necessary... I'm not sure many doctors don't know how to do that, they work with insurance companies enough where it's easy enough to know what magic language to use. However, it demonstrates a level of integrity when THEY DON'T, like Dr. Qureshi didn't means something in my book. He has a sincere interest in his patients' wellness, is very thorough and his bedside manner is perfect. His office staff is friendly, warm and I found them to compliment his well-oiled machine of a practice. I highly recommend this Doctor, as he came recommended to me from one of the most respected Doctors in the Country (literally). This doctor is excellent I would suggest his doctor to anyone in the central Florida area or Beyond because really amazing. The Dr was very kind, funny, and yet professional. He took his time in the evaluation and listened to me and that is important. The whole staff was great and they were a good fit for me as a patient. Dr. Qureshi is a phenomenal doctor who cares for his patients with diligence and precision, still maintaining a friendly but professional disposition, as always. Planning ahead is my greatest recommendation for setting an appointment andasking about which days have the greatest availability, meaning shorter wait times. Although, in most instances, I have been seen in a very short amount of time and rarely have I had to wait longer than you may expect. His staff were professional and hospitable, as always, and I have received nothing but the utmost satisfaction in choosing Dr. Qureshi as my doctor. I highly recommend him to anyone. I had a pleasant experience ! The doctor is very nice !